This Original contract dated November 18th, 1959, is between Peter Lawford and his manger Milton Ebbins for the Motion Picture Photo Play "Oceans 11" and is signed by both. The contract basically stipulates the percentage compensation Milton will receive in regards to "Ocean 11" movie. 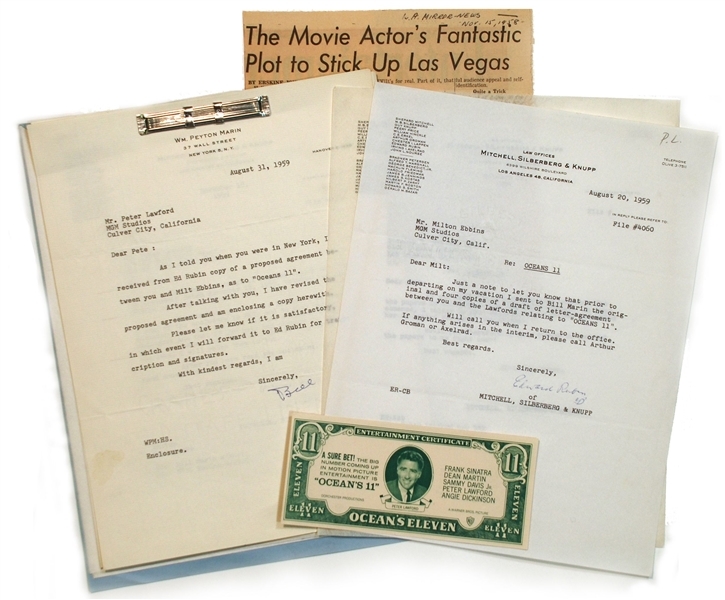 There are 5 other ancillary documents accompanying the contract as well as an original promotional 11 dollar bill with Lawford's photo and a newspaper clipping about the movie. Lawford bought the rights to the movie in 1958. 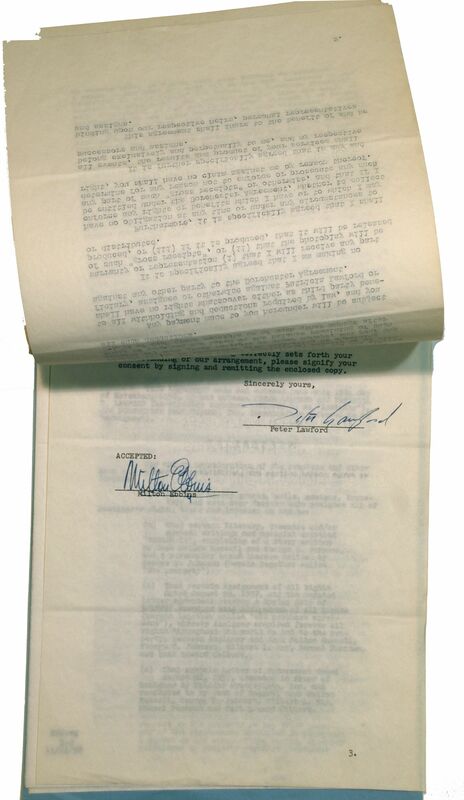 The contract and related paperwork are in fine condition and came directly from Lawford's estate. Ocean's 11 is a 1960 heist film directed by Lewis Milestone and starring five Rat Packers: Peter Lawford, Frank Sinatra, Dean Martin, Sammy Davis, Jr. and Joey Bishop.Centered on a series of Las Vegas casino robberies, the film's other stars included Angie Dickinson, Cesar Romero, Richard Conte, Akim Tamiroff, Henry Silva, Ilka Chase, Norman Fell, Harry Wilson and Buddy Lester, as well as cameo appearances by Shirley MacLaine, Red Skelton, and George Raft. A remake, directed by Steven Soderbergh, starring George Clooney, Brad Pitt, Matt Damon, Andy García, Julia Roberts, Bernie Mac, and Don Cheadle (among others) was released in 2001, followed by a pair of sequels.